The dbstart and dbstop shell scripts do not exist on Windows platforms. Consequently Oracle database startup and shutdown is implemented completely differently. The oradim utility provides more than just the ability to start and stop Windows databases. Windows oradim can create and edit databases. It also allows DBAs to configure script-based installation mechanisms. The oradim utility is used on the Windows platform to perform these tasks. - startup - Indicates that the specified instance should be started. - sid - The SID of the database to start. - usrpwd - The password for the database user. Notice that no password is needed to perform this task. The shuttype parameter specifies what is to be stopped - the service (SRVC), the instance (INST), or both (SRVC, INST). The shutmode specifies the method that should perform the shutdown - (A)bort, (I)mmediate, or (N)ormal. Each operation, regardless of success, is logged in the oradim log file. The ORADIM utility only exists on Windows. It is the command-prompt tool that creates, deletes, stops, and starts instances. If you have UNIX scripts that create databases, you can still use them (modified of course), but you will need to run ORADIM first to actually create the Instance. This command is what actually creates the Windows Service that runs the Instance. An example of a shutdown and startup. These can be used in scripts, such as for a cold backup. The oradim utility can be launched several different ways to accomplish differing tasks. Also, the parameters passed vary depending upon the purpose being invoked. It creates a log file in the directory $ORACLE_HOME\database. Note: Although no SYSPWD password is needed to perform this task, the Windows user must have sufficient privileges to execute this command successfully. The SYSPWD argument is not needed used in ORADIM only when you are signed-in to Windows as admin. Cases where you are not signed-n as admin require SYSPWD. Such is the the case when you execute batch scripts in Windows. Each operation, regardless of success, is logged in the oradim log file (ORACLE_HOME\database\OraDim.Log). This file should be checked for errors after each oradim command is executed. The oradim utility provides more than just the ability to start and stop Windows databases. Oradim can create and edit databases. It also allows DBAs to configure script-based installation mechanisms, bypassing the Oracle Database Configuration Assistants graphical user interface (GUI). For a reference of all oradim commands, use the oradim?help command. A good Oracle DBA will become intimately familiar with the oradim options, and DBAs that start in Linux will often create their own dbstart /dbshut scripts that call the oradim procedure. Oracle on Windows is delivered with a utility that is used exclusively for that Operating System - the ORADIM utility. Basically its mission in life is to create, delete, stop and start Oracle-related Windows Services from the command line. In UNIX or Linux, when you create a database with a script, you use the create database command - that's all you need. In Windows, you first need to create the Windows Service. This is done with the ORADIM command. Again, ORADIM can also be used to stop, start, modify, and delete the service. Please note that when using the Oracle Database Assistant or choosing the create database option when using the Oracle Universal Installer, this step us not necessary since those create the service for you. This would create the ORCL instance (and associated Windows Service), with password mypasswd, allowing 4 users to connect as SYSDBA, with the service set to start automatically, using a pfile of C:\oracle\10g\database\initORCL.ora. A couple things to note here: First, the command is all one continuous line. Second, all that this does is create the Windows Service that supports the Oracle Instance. It does NOT create the database; this you need to do using scripts or commands. Again, if you use the Database Assistant or the Oracle Universal Installer, then the step of creating the Windows Service is done for you. The database itself does NOT get deleted by this command, just the Windows Service. Therefore, one could delete the service, recreate it using the same name, and restart the instance. All of the database files and contents would remain unchanged. Remember - the INST shuttype shuts the instance down, and the SRVC shuttype stops the Windows Service and with it the database. One would generally want the shutdown to be immediate or abort; normal would hang until all users and transactions were completely done. That could take all day! These stop and start commands can be quite handy to use when scripting shutdowns and startups, as well as for controlling things from the command line. The net stop and net start commands can be used to stop and start Oracle Services from scripts and the command line. Either ORADIM or the net command can be used effectively for those purposes. Warning - Your Oracle Database Probably Will Not be Shutdown Cleanly When Windows is Shut Down!!! If you recall, we reviewed Oracle Services in Chapter 6 and discussed the Registry Settings controlling the Oracle Services in Chapter 4. For a reference of all oradim commands, use the oradim scripts here. 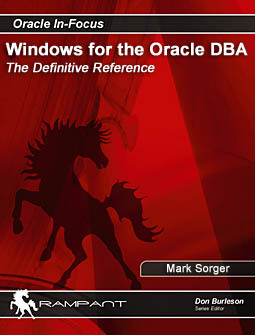 The landmark book Windows for the Oracle DBA is a comprehensive overview of everything an Oracle DBA needs to know to manage Oracle on Windows. Order directly from Rampant and save 30%.